Your early morning beauty routine no longer has to wake up the neighborhood. Introducing the full performance quiet dryer. Toss out your noisy clunker for the latest innovative technology: The power of beauty without all the noise! Vertically mounted fan design for ULTRA-quiet performance. Unique U-shaped air inlets increase airflow for faster dying. Cold Shot button releases cool air to lock-in the style. Centrifugal fan design curved blades maximize speed for optimal energy-efficient results. 2 speed/2 heat professional rocker switches for ultimate drying flexibility. Hanging ring for convenient storage. 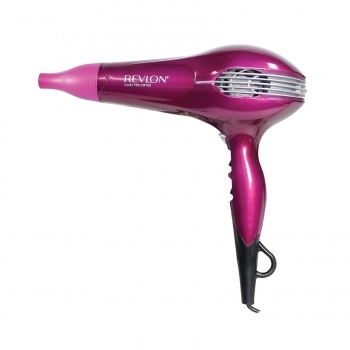 This is all in on this beautiful pink hair dryer with concentrator attachment for precise drying and styling.